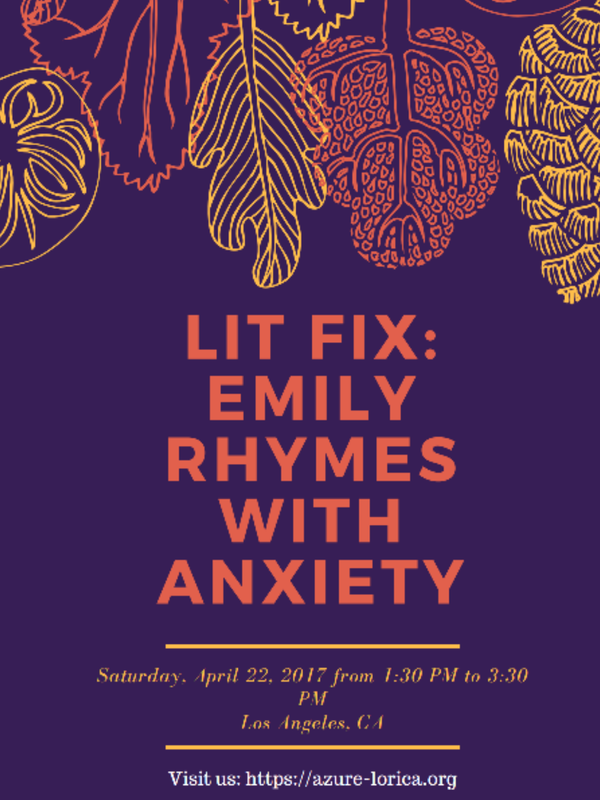 Join Azure Lorica for a lecture and discussion about the history of anxiety through prolific poet, Emily Dickinson! Presented at the Granada Hills Branch – Los Angeles Library, April 22nd (Saturday) 1:30-3:30pm. Emily Rhymes With Anxiety will take you to the closed world of Emily Dickenson and the Victorian society that knew nothing more than witchcraft and hysteria. We welcome you to relax, breathe, and learn techniques to manage anxiety, on an everyday level. This entry was posted in 2017, Newsletter and tagged antibullying, anxiety, azurelorica, Emily Dickinson, Granada hills library, LAPL, Poet. Bookmark the permalink.